Capstone Press has created its own brand of superhero – Max Axiom, Super Scientist – whose exploits uncover the mysteries of the scientific world. Max Axiom, who sports a bald head and cool glasses, dives into many adventures in the series, exploring such concepts as sound, energy, ecosystems, and others. 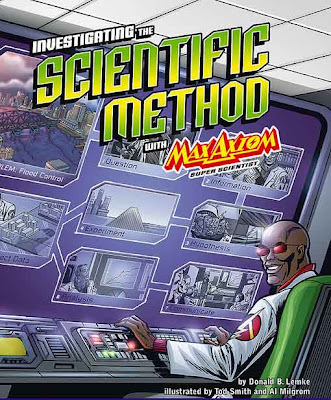 With INVESTIGATING THE SCIENTIFIC METHOD WITH MAX AXIOM, the reader goes through the steps of the process of scientific discovery in a very meaningful way. The story doesn't skimp on explanations and the writer (Donald B. Lemke) and illustrators (Tod Smith and Al Migrom) use the graphics inherent in this form to its advantages, showing detailed illustrations that reinforce the story and explanations. Since I am not a science teacher, I passed on INVESTIGATING THE SCIENTIFIC METHOD WITH MAX AXIOM to my sixth grade teaching colleague, Lisa Rice, and I asked for her impressions. (A side note: it is heartening to see that Max Axiom is a scientist of color as it breaks down the stereotypes of white, geeky nerd scientists tinkering around with chemicals in the lab. Max is not only cool, but he is smart, intuitive and light on his feet). Click here for an alternate podcast link. This title is also available in an interactive CD format (motion comic). You can click here to read our story of that format. I would highly recommend this book for the middle school classroom. It is informative and lively and engages students on a variety of levels. Good post as usual. I appreciated the fact that you went right to the expert, Mrs. Rice, a teacher of science. Having her input gave the review more validity and sold me on the series. Graphic text is a wonderful approach for many subject areas, and it appeals to the visual learner from several different learning styles. I definitely agree about this book. In fact, the whole Max Axiom series does a great job of fitting lots of science explanations and details into interesting comic stories. I've read these aloud in class, but even better, my 5th and 6th graders pick these books out for fun from the library. Hey there, I just came across your site and I have to say I love it! I try to make science comics for my classroom (see my blog if you're interested). Max Axiom sounds like a great resource! The Graphic Classroom is a resource for teachers and librarians to help them stock high quality, educational-worthy, graphic novels and comics in their classroom or school library. I read and review every graphic novel or comic on this blog and give it a rating as to appropriateness for the classroom. CLICK HERE to read my graduate study on comics in the elementary classroom. CLICK HERE to read more about keeping your comics stored safely in your classroom. We make specific recommendations of products that we find work best. 2. You can simply tell me about your creation. If you send me a copy, then I will review your submission. I will be honest and fair and do my best to get your book reviewed in a timely manner. I am a full time graduate student, so my time is limited. If I receive a lot of books, then I will put them on a first-come, first-reviewed list and do the best I can. If you cannot or will not send me a media copy of your book, then you can just request that I review it. My money is short, as I am going to school and not working, so you are depending on my ability to afford your book. There is no guarantee that I will get to your work nor any guarantee that I will even review it. If I can afford it and have time to read it, then I will most certainly review it. It's all about the teachers, librarians and kids. Reviews are never based on free media copies. I am writing my Master's Thesis on the subject of comics in the classroom, so this is important to me. I am committed to this and I take reviews very seriously. I do not rip into books in order to get readership. I will have a critical eye, but I am also excited about helping teachers find great books for the classroom. My name is Chris Wilson. My first name is Jack, which is why you see it on the posts, but I usually go by my middle name: Chris. Having worked as the Managing Editor for a weekly newspaper then as the Director of a non-profit for people with disabilities, I have gone back to school. I am now a full time graduate student in the college of education at Missouri State University. I am getting my Masters of Science in Education – Elementary Education. I know that reading is a problem for many students today. I feel strongly that comics and graphic novels can be one way that we can combat this problem. Graphics novels should be in every public school library and classroom library. That is why I am choosing to write my thesis on using comics and graphic novels in the elementary classroom. Some comic literature is not appropriate for every classroom, or every community. Some are not appropriate for any classroom. You need to review any piece of comic literature for yourself and determine if it is appropriate for your grade, class, curriculum, goals, school and community.